The Thanksgiving holiday this year found me spending time with family and friends, and also some time alone reading through Donna Cunningham’s Stellium Handbook. 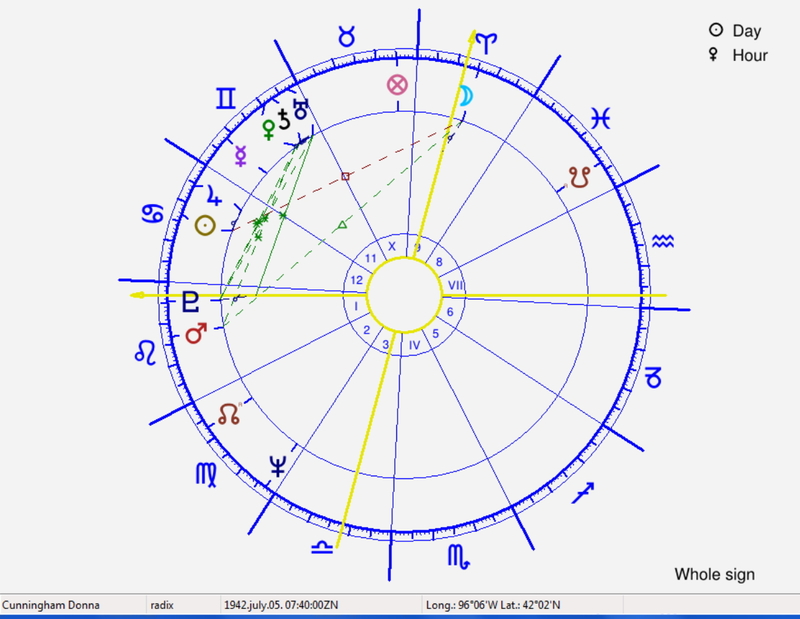 Donna Cunningham, natal chart with Whole Sign Houses. Note stellium in Gemini in the 11th house, which is also present in the Placidus House system. Before reading this book, I never realized that so information that could be gleaned from analyzing stelliums in a natal chart. Donna’s approach was an eye-opener. This book is refreshing both for its new insights and its transparency of presentation. Donna states her premises clearly so that astrologers of any persuasion can judge where she is coming from. She prefers Placidus houses but is not dogmatic about their use. She bases her delineations in Zip Dobyns 12-letter system (which goes back to Alan Leo in the late 1800s) but also expresses her misgivings about Dobyns’ approach. Her goal is to make matters simple so that beginning astrologers will be able to use her book productively. Donna uses the modern planets (Uranus, Neptune and Pluto) as sign rulers. Because she is so explicit about her premises, traditional astrologers will have no difficulty adjusting Donna’s findings about stelliums to their own astrological belief systems. Basically, the book deals with two important phenomena that can occur in birth charts: the stellium and the superconjunction. An example of a superconjunction of Pluto, Saturn and Uranus in Virgo can be seen in my post about the chart of the sadistic missionary Junipero Serra who enslaved and maltreated the native Americans of California and brutally forced them to adopt Christianity. Donna provides several fascinating case examples. For me the most interesting was the comparison of the charts of Johnny Depp and Robert Downey Jr, who share a Pluto/Uranus/Mars conjunction and have almost identical angles (ASC and MC) but whose lives have evolved with distinct differences. Donna’s book contains worksheets for evaluating the strength of each planet in a stellium and explains how to judge the order and importance of each planet’s role as the stellium is triggered by transits and progressions. It is written with beginners in mind but contains much valuable information which will appeal to experienced astrologers. All in all, I thoroughly enjoyed this text and learned a lot by reading through it. I will never look at stelliums the same way again. This entry was posted in Astrology and tagged book review, Donna Cunningham, Stellium Handbook. Bookmark the permalink. that is a very nice review tony! donna would probably enjoy knowing you wrote it! i think she is a fantastic astrologer and writer of astro books myself.. i haven’t read this, but i am sure it is great. thanks for the heads up.. I sent Donna the link so she is aware of the review. It’s an interesting book which looks at stelliums in depth. Who knew there was so much to them?